Amidst all the most powerful and noble beings in all of the multiverse, there is one that reigns high above all others. The mighty Odin has bowed down. The great Empress of the Nile begged its advice on beauty. An entire species has devoted themselves to the deep worship of its many icons. Kings, lords, and deities alike all bend ear in longing hope to hear even the meager utterances of this glorious entity… the grand and majestic deity who reigns above all… the Lord Banana. We’ve always know that the color yellow is underrated, but we could never guess how much it was taken for granted. Looking around the world, it is clear how often the color appears to depict a sense of innocence, curiosity… even joy. They’re all over the place on the Internet, those squishy odd little yellow creatures so desperate and eager to impress their masters. Crying out with joy at the mere sight of their most glorious of treasures: the banana. It should not have surprised us to realize to whom our prayers should have long been sent! 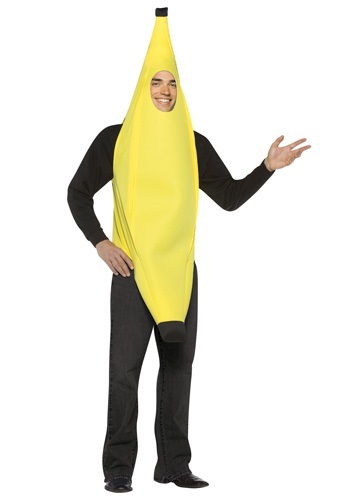 It is time to rise up and stand before your flock of worshipers with this Adult Banana costume. This foam tunic has a back zipper and opening for your face and arms and a mesh panel works to guise your face from your onlookers. But, the brilliant yellow panels of this costume reveal the glorious peal of the One True Banana, praise be its potassium. Be kind and benevolent to your flock, Banana God. Remember that we loved you first.